For about three-quarters of a year now, I have been having low energy and battling keeping my weight from going up. I have managed to keep it down to a 21 BMI, but I want to get back to 19. I have eaten correctly, I have exercised a lot, and I am so frustrated and pissed off because I work hard daily to have better conrol on the numbers. I finally saw my doctor and it was my thyroid. 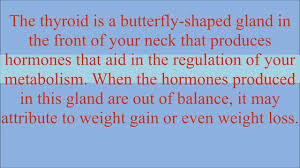 I have been on medication for my thyroid for years and it my body was now needing a change. My tests came back showing I need I have been battling new numbers and weeks of waiting for the medications to kick in and balance. It has been a real hassle and hard because I have to be even more careful to eat closer to 50g of carbs per day. And it is hard to exercise when you feel like you could just lay down and die. I started to lose weight easily when my medication kicked in, but it adjusted again and now it is hard again until my new medication arrives in the mail, that is if my insurance company can finally send it to me! 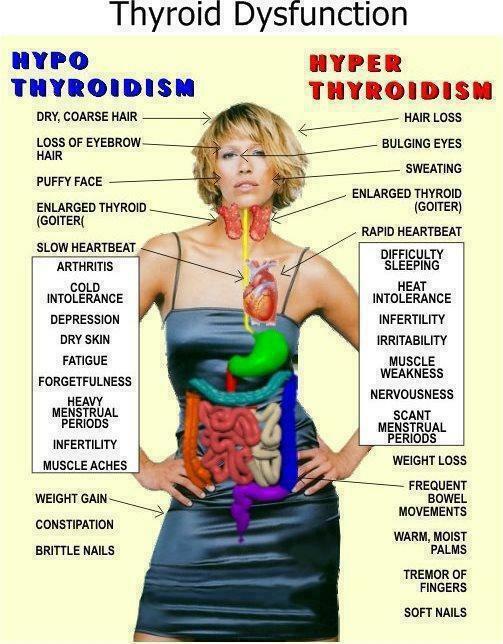 My point: If you are following the rules and you are still having trouble with your weight, get your thyroid checked out. And don’t let them do just one test, which could show nothing. Ask for the whole shebang. So, ask for this. See your doctor and ask. It will be easier to control weight if your body is your friend and not your enemy! 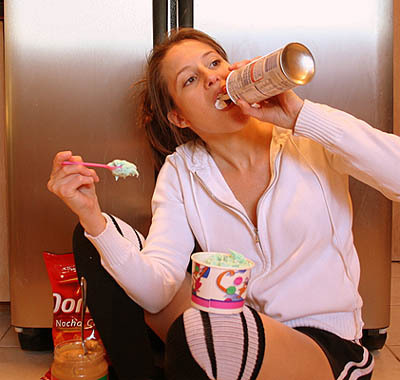 11 Ways To Deal With Cravings When On A Diet! I hear this all of the time and I went through it too. I sometimes still do. How do you get through cravings, especially at home at night. or mid-day? 1. You have to set a goal. I told myself every morning that I was on a MISSION and that mission had to be done, no matter what. I set a goal to lose a certain amount of weight. 2. Recognize that cravings mean something and fix the problem before it becomes a problem. First off, sometimes you will crave things because you are deficient in a vitamin or mineral. People who crave steak are low in iron, bananas–potassium,chocolate-magnesium, etc. So, take a MULTIVITAMIN AND MULTIMINERAL all through your diet and after to help with unnecessary cravings. 3. Go shopping and only buy the foods you are going to eat on the diet. Do not buy junk. You want junk for the kids and you are afraid you will eat it too? Well, I have something controversial to say here. Screw that! That junk hurts your body and mind, and it is not only BAD for your kids (they need white flour and sugar like a hole in the head), but you are also setting them up on a path of weight gain in their future too by allowing them to get hooked on pure sugar crap! Teach them to enjoy healthy, tasty options for their snacks. Nuts, fruit, cheese, protein bars. The Nature Valley Protein Dark Chocolate Peanut Butter bar (for instance) or their other Protein bars or any of the Power Crunch bars are low in carbs, high in protein. What the heck is wrong with those options? Cheetos, Doritos, Tortilla chips, candy, cheese balls–are all BAD, BAD options and will only make you sick. Buy low-carb baking books, look it up online, buy low carb food books, buy low-carb options at the market or online at places like netrition.com or low-carb stores online. Some items are at speciality stores. 4. Stop baking BAD stuff (look up better low-carb options online. No more baking crap white flour nonsense in the house. Just knock it off. You don’t need it. Oh, your kid enjoys it? Well, too bad. You all need to find a healthier hobby or learn sugar-free options for baking and look at number one (set a goal) and go shopping (rule 3) and get new stuff to bake. Having bad food baking and wafting through the house is torture on a diet. It will just pull you back into the dark side of bad fattening food. If it is made with white flour–NO! You or your kids have to find recipes using coconut, almond or flax meal and make those things. Step outside of your fattening comfort zone and learn new tricks. Teach your loved ones to eat better WITH you. 5. Tape a picture of yourself looking fat on the refrigerator so that you will be reminded why you are on the diet in the first place. 6. Throw out the bad food or give it away. If it is there, you are gonna eat it! 7. Drink water and have lots of sugar-free options to drink. Drink every time you are hungry, to help stop cravings. –a piece of low-fat string cheese, a slice of turkey, an egg, a protein drink with few carbs in it–but have a protein “hit”, so you get through the cravings, until your next meal. Read, get online, call a friend, or go exercise. Exercise or walking the dog helps me. Exercising at least 30 minutes a day, 3 times a week, not only burns calories, it helps reduce cravings. So, move! 10. Find ways to de-stress. 11. Keep a diet journal showing what you ate and the number of carbs per meal and tally it all up daily. Also, use that journal to write when you are emotional and try to process what is bothering you instead of eating. Consider therapy or a group like Overeaters Anonymous. Or, if you must eat, follow rule number 7 and avoid so-called, “comfort” foods. Those foods will only make you feel UNcomfortable tomorrow when you gained weight! I had a lady tell me recently that she wanted to lose weight, but was not willing to make the kind of changes necessary to her diet because it is “too hard” to give up foods that she craves. I have written about how certain foods have been created by companies, after their own scientists have experimented on combinations of sugar, salt and fat, to the point of what causes pleasure to the brain–therefore causing the brain to crave those food items later when the pleasure is needed. People want to increase those pleasurable points especially in times of stress or boredom. But, how different is this kind of need to any other common addiction? And if you don’t care about yourself, think about your kids. If continue eating this way, and teaching your children to eat this way, you are preparing them for a possible life of disease and early death. 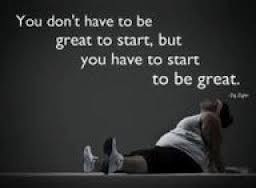 Yes, it is hard to get through the first week or two (stage one) of a lifestyle food change (diet) because you are fighting off physiological and psychological cravings. So, besides taking an appetite suppressant temporarily until your boys is used to the correctly sized portions and the correct healthy foods. 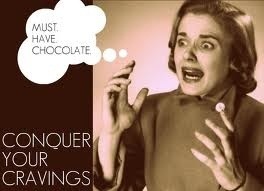 –-7 ways to help deal with cravings. If you go longer than five hours without food, your blood sugar will drop and your cravings will begin, You need to eat every 3 to 4 hours. If it’s time for an allowed snack, choose food low in calories and fat. 2. Eat protein in every meal to fend off cravings. 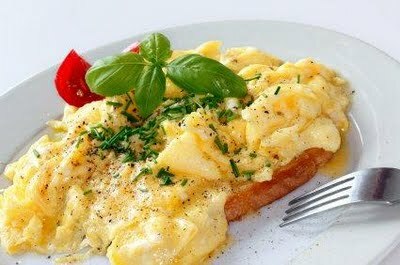 You should include some source of lean protein, such as skinless chicken or turkey, fish, eggs, or low-fat cheese. Protein helps to control blood sugar patterns and can help prevent food cravings, Foods containing protein also help you feel fuller by stimulating production of cholecystokinin (CKK), a naturally occurring appetite suppressant. **AND most IMPORTANTLY–always eat breakfast protein. Research shows that starting your day off with breakfast helps in burning fat and in cutting down cravings. Dehydration can cause some people to crave salty foods. The solution is simple: Drink more water. An 8-ounce glass of refreshing water can help you feel full and get your mind off your food cravings of the moment. 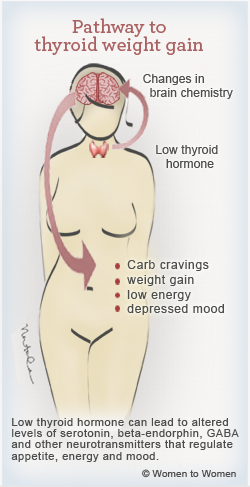 In fact, what you think are food cravings may actually be thirst. Drink water and the food cravings should go away. Keep a water bottle handy throughout the day to make it easy to satisfy your fluid needs. When the craving is psychological, it is meeting a need different from hunger. Hunger caused by boredom, anxiety, or other emotions is by finding an activity that will take your mind off your craving without adding calories. Call a friend. Exercise. Tune into a ballgame. Listen to music. Read a mystery. Watch a movie. Find something to do. Another way to beat food cravings when they are psychological is to replace eating with an activity you find pleasurable and emotionally satisfying, Do something you really enjoy that doesn’t involve an intake of calories: Take a bubble bath, read a fun magazine, do your nails, go have coffee with a friend.. Or look for options that burn calories, like taking a long walk with a special someone. It’s a way of being kind to yourself without sabotaging your weight-loss efforts. Research suggests that some people can become addicted to refined foods, such as white bread, white pasta, and white sugar. The more you eat, the more you want. Break the cycle. 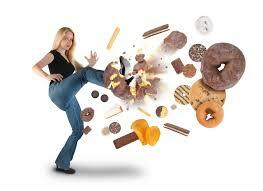 Eliminate refined foods from your diet and you could curb your food cravings. Go the extra step and refine your diet by replacing the refined foods with whole grains and fiber— eat more nuts, beans, legumes, fruits, vegetables, and whole-wheat foods. Remember that fiber makes you fuller and is great for your digestion. **Fiber fill you up, makes you feel less hungry! 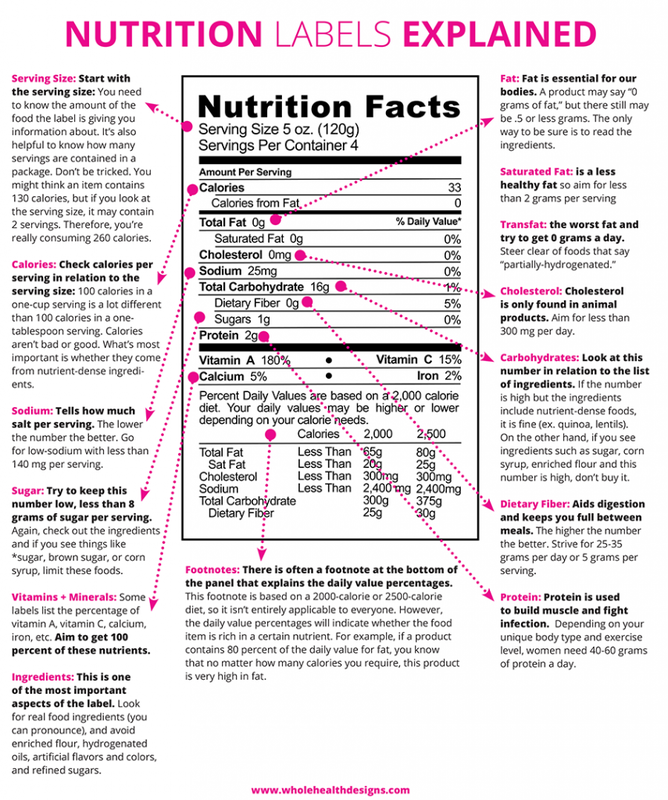 And when you’re scaling back on refined sugars, be sure to target high fructose corn syrup (HFCS). HFCS is used as a sweetener in many foods, from bread to frozen dinners, because it’s inexpensive and increases shelf life. New research shows that high fructose corn syrup can be a trigger food in animals — having even a tiny amount will make them want more. Scientists are studying whether HFCS may have the same effect in humans. I have put up Jorge Cruz’ recipe for a small microwaved-made chocolate cake, which is low carb and delish. I have discussed cauliflower-based pizza, low carb tortillas and recipes using them. I have listed sites like Netrition.com, Carbessentials.net and Lindora.com, for example, which have food items for low carb cooking and baking. 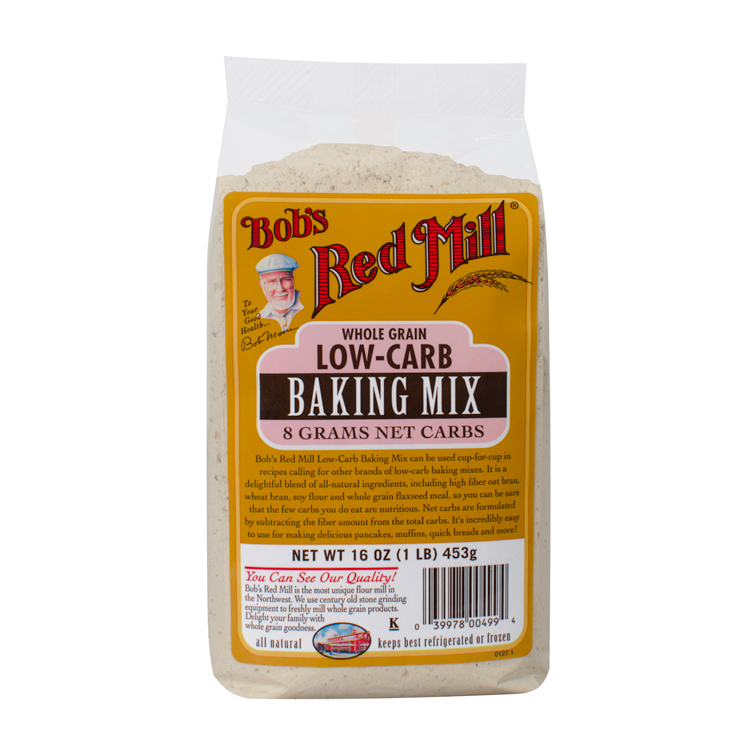 There are great tasting low carb alternatives for bagels (Western Bagel’s Perfect 10 bagel), low carb baking mixes, pancake mixes, pasta. I have put up different recipes and even mentioned low carb websites and cook/baking books. I have discussed portion control and how you have to eat often and especially breakfast. I have discussed the importance of measuring g food and learning shortcuts for measurement (a portion of meat is the size of the palm of your hand or a deck of cards). I have also mentioned 4 small servings of veggies a day, two of fruit, which fruits are lower carb than others, etc. If you insist on eating easy-to-buy and pre-made food items or fast food, (which are NOT diet friendly), despite your desire to lose weight or constant complaints about how you look or how tight your clothes look on you (and you think a little exercise is the only thing that will help–but for years now–it has not), then you are not going to lose weight. 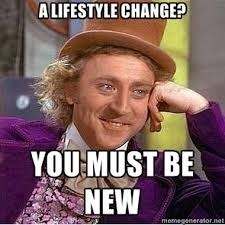 You have to be willing to learn about new foods, look up carb counts, get out of your chair and stop being lazy. There are good alternatives out there, so get cracking at looking things up on Google and finally be skinny. Either use the tools or forever hold your peace. Find the time–you are worth it. Today, I was in my Pilates class and I was listening to a woman explain that she follows Weight Watchers, but there are sweets in her house (two teenage boys) and she winds up following her plan for a few days and then succumbs to the sweets because of the cravings. One issue that is a whole other Oprah, I will discuss in another blog soon — that I think it is a mistake to have sweets around for teens with the excuse that they are teens. There are so many delicious HEALTHY options for teens and kids that it is just a poor excuse because they are growing fast and need calories to burn, that you can give them EMPTY calories in the shape of cookies and cake. But, that will be for another day. Today’s issue is what is causing MOMMY (or Daddy’s) cravings? Two things! 1. 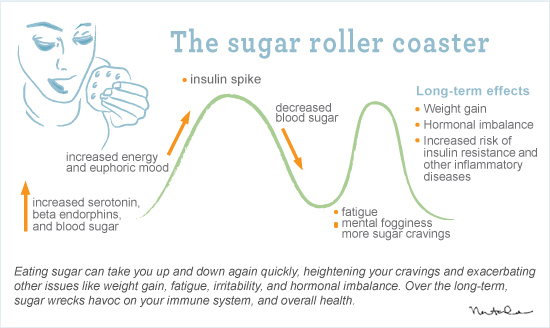 You are addicted to sugar and you have to get off and allow yourself to get through withdrawal (like crack addiction). 2. 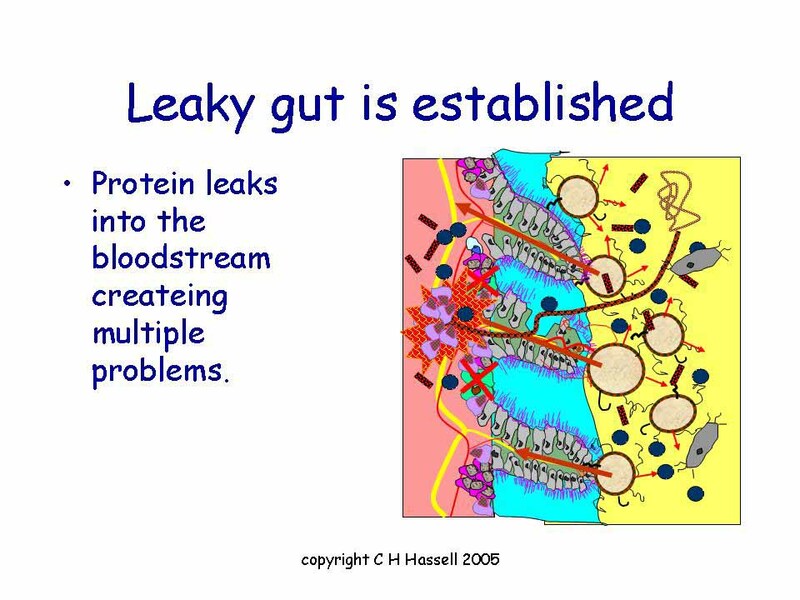 You might have Leaky Gut Syndrome. You might ask, “What the heck is that?” It is a real medical condition that not all doctors know about or talk about, but good ones do. Your doctor might scoff, but then you will need another doctor. Dr. Andrew Weil knows about it and writes about it. 1. avoid alcoholm NSAIDS, any foods that you’re allergic to. 2. Make sure you’re eating plenty of fiber. 3. Take Culturelle or another probiotic supplement containing Lactobacillus GG. 4. Eat an anti-inflammatory diet, including essential fatty acids like fish oil and GLA. In addition, you might try supplementing with glutamine, an amino acid that helps maintain intestinal metabolism and function and seems to benefit patients who have had intestinal injury from chemotherapy and radiation. 5. Cut sugar out of your diet as much as possible and follow a MEVY diet (Meat, eggs, vegetables and yogurt) if you can’t follow the anti-inflammatory diet. If you eat fruit, stick with fruit that has low sugar like berries or citrus. A side benefit is that you will lose weight. You will have sugar cravings for about a week, find something to keep your mouth happy like gum, lots of flavored water or coffee. Try to avoid milk for awhile–lots of sugar. Use non dairy creamer if you need light coffee. Sweeteners can be an issue, and if you like the taste of Stevia at all, use that. 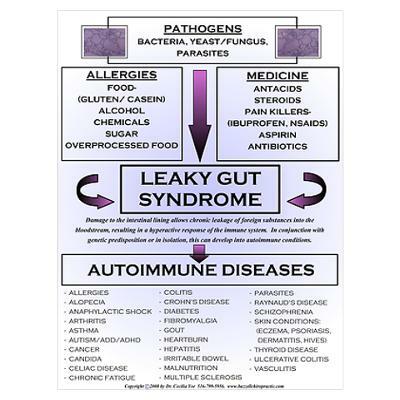 I couldn’t give up my Splenda–so getting the Leaky Gut Syndrome cleared up for me took many months.